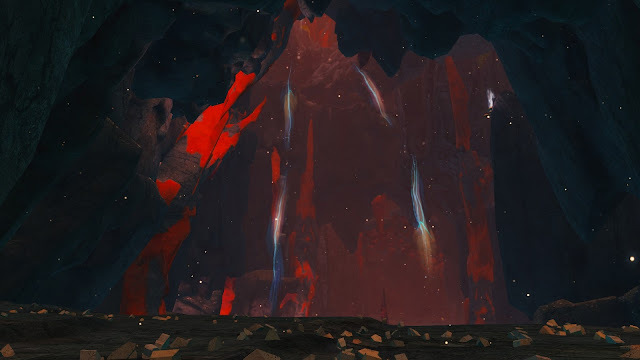 Jeromai has an excellent post up analyzing the attractions of GW2's new map, Bloodstone Fen and the way it plays to an entirely different demographic than the raid content ANet have been pumping out for the rest of this year. He neatly outlines the attitudes and expectations of two major playstyles - Low and High Energy - both which should be immediately recognizable to anyone who's played MMORPGs over the last fifteen or twenty years. If you browse the official forums you can easily spot the two demographics as they give feedback on Bloodstone Fen. The high energy crowd are complaining the map is small, boring, has nothing worth getting and anyway they've already finished it in a just a session or two. The low energy folks are praising it to the skies, saying what a great time they're having, how they have their freedoms back and how this is what the game is meant to be. It won't surprise anyone who reads this blog to know I'm in the latter camp. If I had a motto for gaming it would go something along the lines of "if it's not fun, don't do it". I have no issues about dropping things as soon as I notice I'm not enjoying them. Life is already filled with things we don't want to do but can't avoid. I see no rational reason for dragging that painful inevitability into any voluntary leisure activity as well. 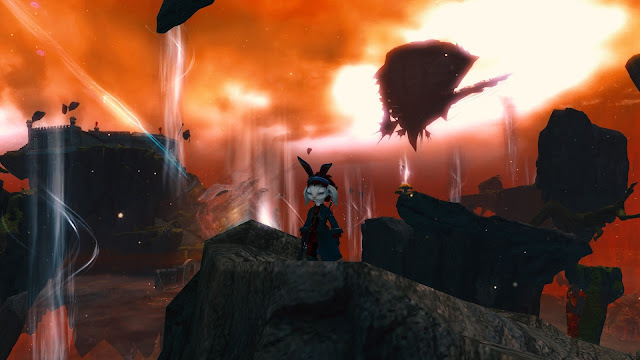 Being able to sort all activities easily into "this is fun" or "this isn't fun" and keeping or discarding as appropriate was one of the key attractions of Guild Wars 2 in the first place. The original game didn't require you to do anything specific at all. The player was given absolute agency. Take the Personal Story as an example. Most MMOs these days have a core storyline, a narrative that the designers expect players to follow. Star Wars: The Old Republic built the entire game on that "fourth pillar". 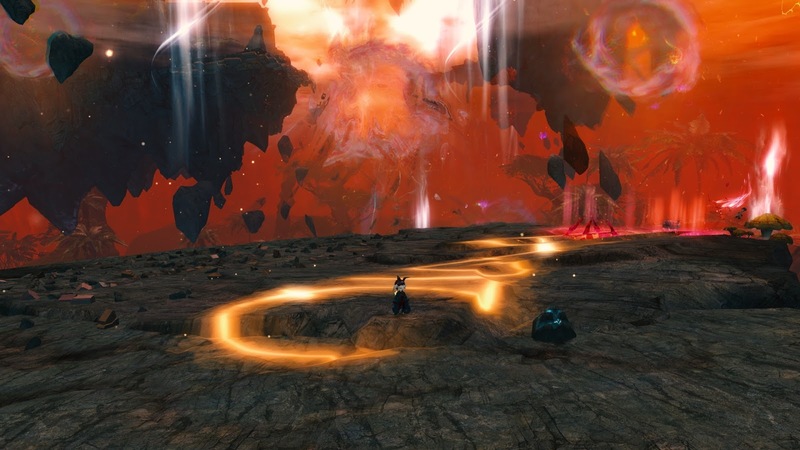 Final Fantasy XIV gated almost all significant character progression behind steps in the story. World of Warcraft, in Cataclysm, constructed a leveling path that was predicated on completing each quest hub before any new ones would open up. At launch GW2 had a detailed "Personal Story" with multiple, branching starting points for each race that eventually came together in a unified sequence for everyone that climaxed with the death of an Elder Dragon. After four years and with sixteen max-level characters I have never finished it on any of them. It blocks nothing and not doing it has absolutely no effect on any other aspect of the game. 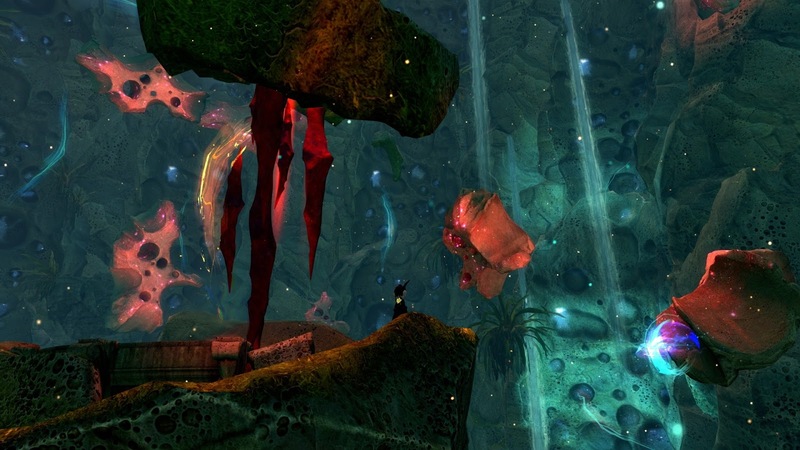 In the original conception of GW2, everything was optional: dungeons, World vs World, PvP, PvE, storyline - they all existed in glorious isolation. There were some small anomalies, like having to open WvW maps for PvE map completion, but not only were such things the exception. Once pointed out, ANet's response was generally to remove them. In the run-up to launch there was a lot of talk about flat leveling curves and horizontal progression. There was to be no gear grind. You would be able to level your character by doing literally anything - fighting monsters, following the narrative, exploring, crafting. Even picking up other players after they fell down would give experience. There would be no quests because, as Mike O'Brien put it, "we’ve all clicked so many exclamation points and accepted so many quests in our lives that we’re pretty immune to quest text". Instead we would get a "Living World". It all sounded amazing. A lot of people bought into the concepts outlined in the now-notorious "Manifesto". For a while what was promised was, broadly, what we got. I don't remember any occasions where "a centaur wheels a siege machine up to the outskirts of a village" nor has either of my elementalists ever picked up a boulder thrown by a "Stone Elemental" and used that boulder "to create a meteor storm" but hey, things can change in beta. In essence the game we got at launch was the game we were expecting. It was too good to last and it didn't. Without rehashing the whole sorry timeline, ANet blinked at the first confrontation with the very audience they'd supposedly rejected - the players who craved a competitive, directed experience with vertical progression, power creep and formal grouping. "High Energy" players, whose primary motivation was achievement and overcoming obstacles, in other words. From then on the story was one of increasingly desperate appeasement. Beginning with the addition of fractals, ascended gear and achievements, it was a path that led inevitably and, we can but hope, finally, to raids. Like many, most, MMOs before it, GW2 spiraled down the rabbit hole of trying to be all things to all players, with the inevitable result that it ended up being nothing special to most. Heart of Thorns saw the apogee of that process. Even the raids that have churned out over the succeeding six months are a part of the HoT experiment not an extension from it. 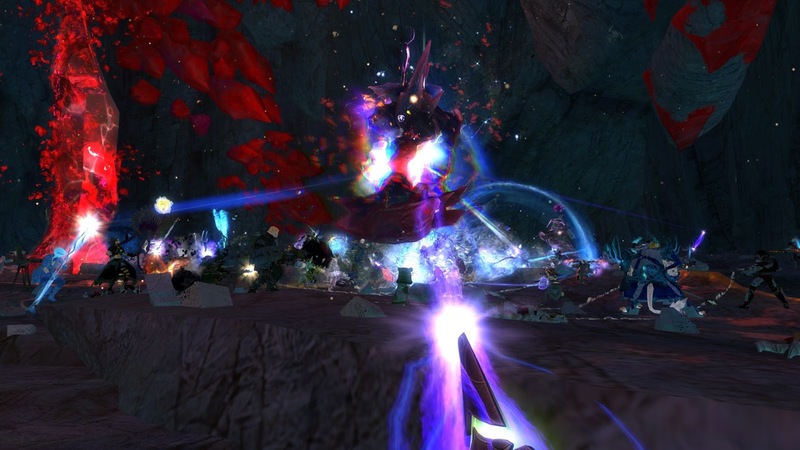 GW2's first expansion underperformed both critically and commercially and the narrative ever since has been one of damage limitation and brand reconstruction. 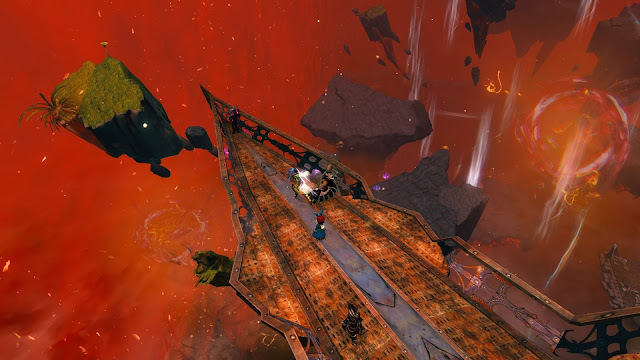 All of which brings us to Bloodstone Fen, a rather small map that, in Jeromai's words once more, "looks like it was cobbled together using a ton of re-used assets" as it "specifically addresses a number of reaction feedback from HoT" in "a mad iterative stopgap scramble to band-aid fix some issues". And yet Bloodstone Fen is fantastic. It brings back the complete freedom of action, of player agency, that so many found missing in Heart of Thorns. There are no long "meta" event chains to complete, no map-wide timers, no overarching targets to hit. Instead there are the small, medium and large Dynamic Events of the kind you'd expect in Core Tyria, the maps that came with launch. There's gathering and exploring and general pottering about to be had. You can set your own pace, come and go as you like. It's a Low Energy map with High Energy graphics. Oh, it isn't perfect, not by any means. It's genuine "high level" content of a kind the original manifesto suggested GW2 would never have, for one thing. You can't even enter Bloodstone Fen without a level 80 character. Technically, there is still one loophole they haven't closed that would get you in but you won't be having much - or indeed any - fun without a full set of gliding masteries. As several posters on the forums have complained, there's an absence of the kind of quotidian NPC activity that made the original maps feel so convincingly lived-in. Bloodstone Fen is not a place where you can imagine anyone choosing to settle down. I guess that's hardly surprising given it was Ground Zero for a continent-rocking explosion not a week ago but there's no sign that anyone ever lived there. Following on from my recent post on the attractions of low-level gaming in MMOs and the appeal of adding new places to begin even as the games mature, it's sad to say I don't see any prospect of that happening in GW2. ANet have wedded themselves to the concept of horizontal progression at the existing cap of 80 and it looks certain that all future content will be constructed with that paradigm in mind. If so, I hope Bloodstone Fen is a strong indicator of how they'll seek to achieve that goal from now on. It may be missing the depth of detail that make most of the sub-80 maps such a joy to explore but at least it has the Low Energy, endlessly repeatable gameplay I came to GW2 in search of four years ago, and that's something that has become increasingly hard to find in recent times. Hey, I'm roleplaying a chill charr! Mass murder, arson and wholesale devastation of communities and ecosystems is what we do on our days off... according to the humans anyway. Pah! What do humans know? Reaction to HoT within the game was mixed at best. The general opinion was probably more negative than positive. Obviously you can't judge everything by forum posts but the trend there was not encouraging. Although much of that is positive, earnings for GW2 over the first 6 months post-HoT were bolstered by strong item shop sales. Note the comment "The performance of HoT was not as expected". Secondly, around the same time Colin Johansen, prime proponent and architect of HoT and the direction of travel associated with the expansion, left the company and Mike O'Brien took over. Mike's first act was to announce a major update that "is about reducing grind, clearing away some tedium, getting quickly to the fun, and improving rewards. We’ve always said that Guild Wars should be about having fun rather than preparing to have fun, and this will be a back-to-our-roots kind of update". That's tantamount to an apology and an admission that HoT had been poorly received by the playerbase. All subsequent changes have been broadly in the direction of making the game easier, more casual and less "Heart of Thornsy". Of course, now we are headed that way there are increasing loud voices being raised complaining that it's all getting "too easy" but as the NCSoft earnings call says about the under-performance of HoT, "We have taken that as a lesson". With luck we won't see the same mistakes being made in the second expansion - although I'm sure there will be new ones! Personally I liked HoT a lot more than I thought I would. I understand why it was unpopular with a lot of people but I had a lot of fun there. I do think that I would have had even more fun if they'd tuned it as it is now before they released it though, but that applies to a lot of expansions in a lot of MMOs - they're usually better a few months after launch. 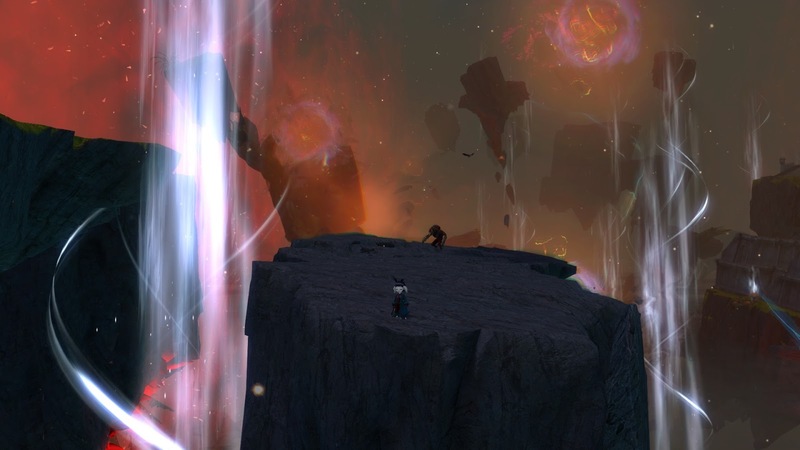 I can actually remember the exact moment that GW2 "spiraled down the rabbit hole" for me. It was after the introduction of ascended weapons, and the patch that rejigged Legendary weapons so that they would always have the best, ascended stats. I played WvW almost exclusively (except for some low level PvE to understand my class), and you could easily outfit yourself at that time in exotics with WvW karma rewards. Then one day I was passing a tower near spawn and I saw a red name flashing an oversized black sword with trailing streaks. I felt a tinge of fear, which I had never felt before in WvW based solely on someone's gear. Yet there it was. A player who had spent hours and hours and hours grinding out gold in PvE now had a gear advantage over someone (me), who played exclusively WvW. Don't forget it had been promised pre-launch, alongside the Manifesto, that people could live in WvW and never have to adventure outside it. (And say what you will about the stat difference is not that great. The point of this thread is "play your way", doing what is individually fun. Personally, smaller scale WvW was always the most fun, and ascended weapons were a measurable power creep within that niche). I still check the official WvW forums every few weeks. WvW on Tarnished Coast was definitely one of those gaming experiences that imprints itself on you, and that you never let go of, even after you've moved on. And there is still the hope Anet will somehow miraculously make it what it could have been. That seems a faint possibility though, so ESO AvA until Camelot Unchained launches. The Ascended gear reset was a tipping point for a lot of people. For all that ANet claimed that tier of gear had been planned pre-launch, it still arrived out of the blue and appeared to be a direct response to the Karka Debacle. I was pretty cross about it at the time and I still don't have any characters in anything like full Ascended even now. Looking at it as positively as possible, four years on Ascende dis still the only gear level above Exotic so it represents a flat line of sorts. On the other hand, HoT cleverly managed a good deal of power creep without adding another gear tier. Try playing WvW without a HoT elite spec and see how far you get. Ok so long as you stay tight to the zerg. Then again, WvW is in such a tailspin for so many reasons that's hardly even in the top ten things wrong with it. I think you and Jeromai hit the nail on the head when it comes to the Low and High Energy thoughts. I completely identify with the Low Energy description, and agree that it was a shift to please High Energy players that lost me in GW2. And I was a HUGE GW2 fan at launch. I'm glad the new area is turning that around. It's a shame that I'll never get to try it and see if I'd enjoy the new direction, because I still refuse to give them money for an expansion I'm not sure I'll like. I maintain that it's a missed opportunity that they don't reach out to the Low Energy playerbase they lost during this mess and at least offer a trial of their new season, even if it's just for a little bit. I know I'd totally give GW2 another shot in this case, especially if the story is returning to known GW1 lore, like White Mantle. Heck, if I liked it enough, I MAY have bought HoT to unlock the rest of it. But I'm not going to pay for HoT before I know for sure that GW2 is trying to appeal to players like me again. So I guess it's wait and see still. I did unlock the chapter, though. You know. Just in case they smartened up about it. HoT is definitely a more High Energy experience than Core Tyria but with the heavy nerfing it's received over the last few months it's not *that* different. I actually think even the original "difficulty" was overrated. I certainly don't think that anyone who can manage FFXIV's much harsher content gating and gear requirements would find HoT much of a challenge. It's far more flexible and forgiving than that. You missed the half price sale but if you don't mind waiting quite a lot longer, HoT will be bundled in with the second expansion, whenever that arrives. That might be the time to try the waters again.